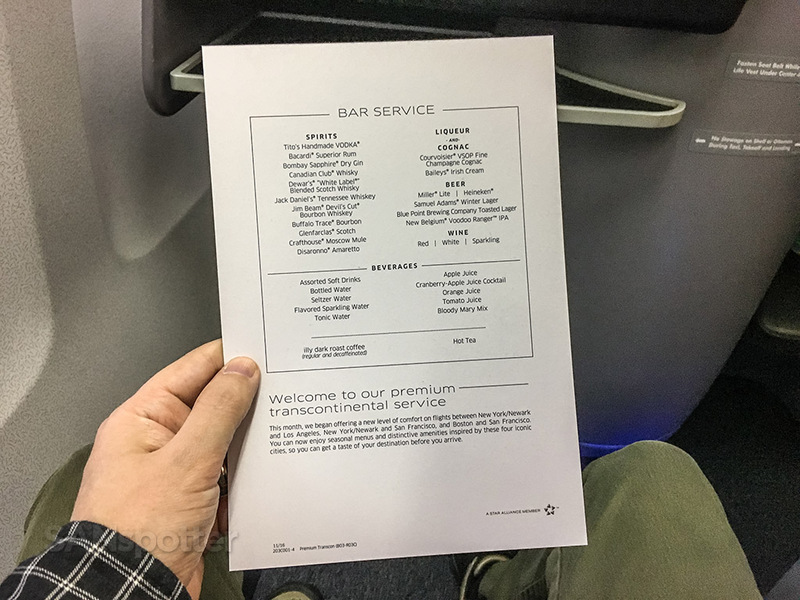 I remember very clearly when United Airlines first introduced their premium trans-continental business class service between LAX and JFK way back in October 2004. 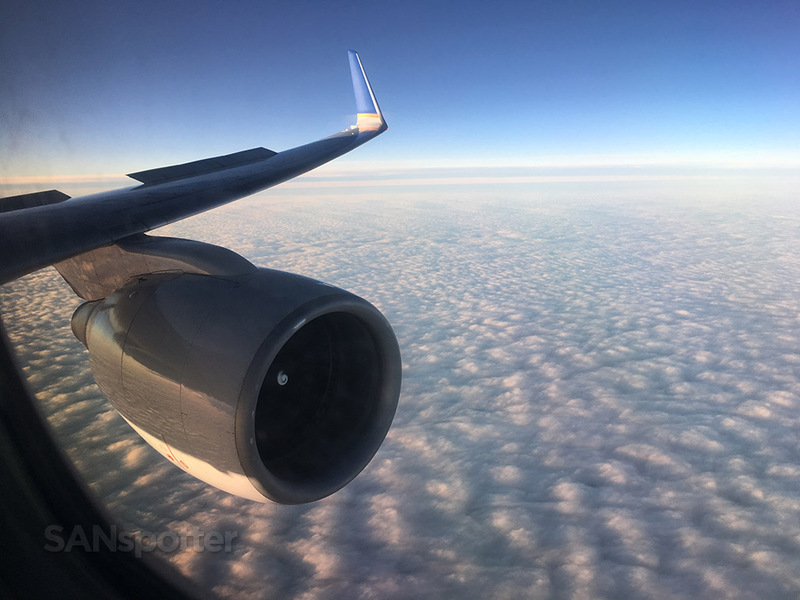 I was a much younger flyer back in those days who could barely afford to fly economy class, so although I had no direct experience with other business class products flying between Los Angeles and New York at the time, I knew immediately that this new P.S. service was the new king of the mountain. It looked so good, and I was totally jealous of all the people on flyertalk who were writing rave reviews about it. 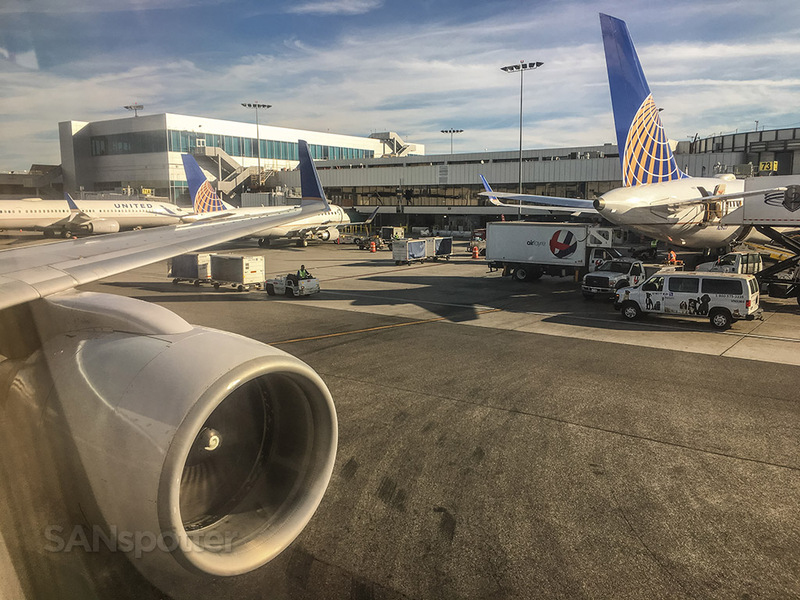 Fast forward 14 years, and I finally found myself pacing terminal 7 at LAX ready to board my first ever United Airlines 757–200 premium transcontinental business class flight to New York. Yeah, I’ve been known to procrastinate a bit. United Airlines 757-200 (N588UA) side view illustration by norebbo.com. Seat map of this United Airlines 757-200 (courtesy of seatguru.com) showing my seat (4A) for this flight to EWR. 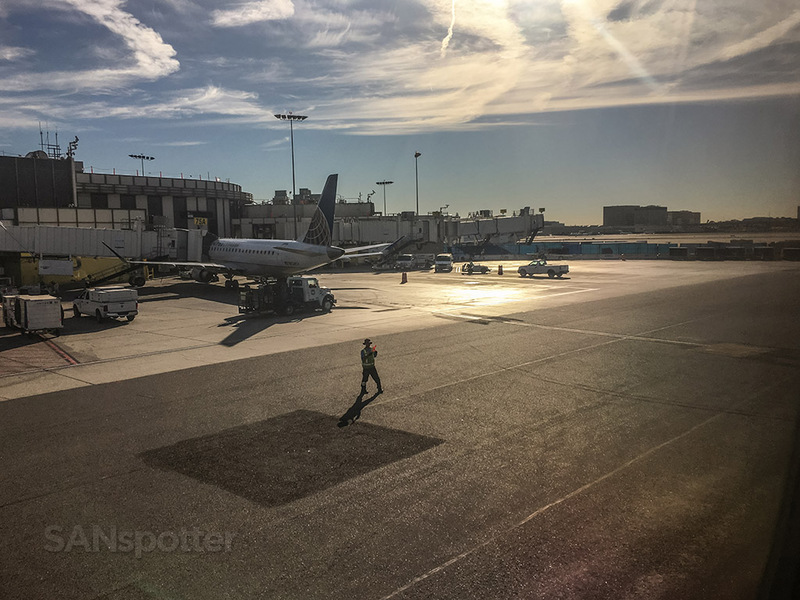 Terminal 7 LAX. Let’s go see what this fancy schmancy United P.S. thing is all about. It’s actually not so bad in here except for the complete lack of windows. 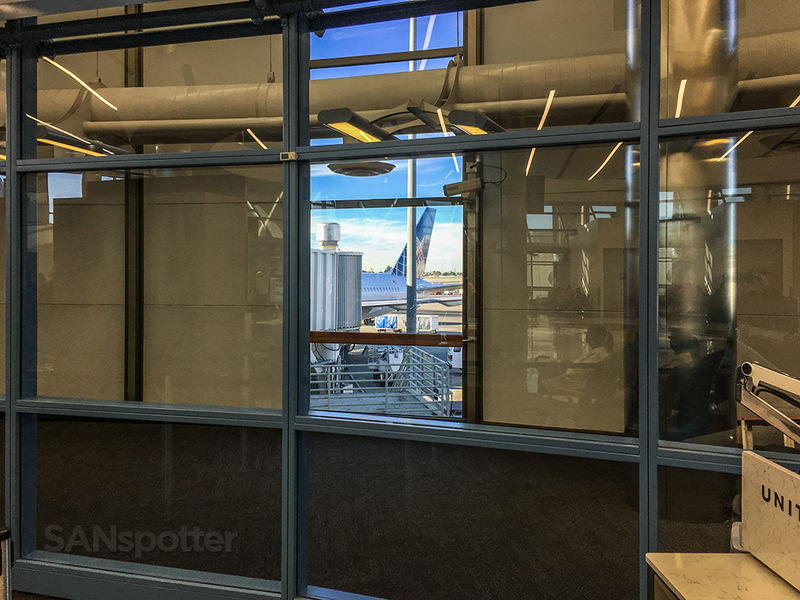 It should be a rule that ALL airports must have clear and unobstructed views to the outside! 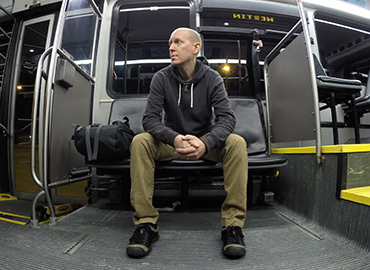 Architects who fail to comply would be punished by having to fly the main cabin on Spirit Airlines for the rest of their life. This is it. 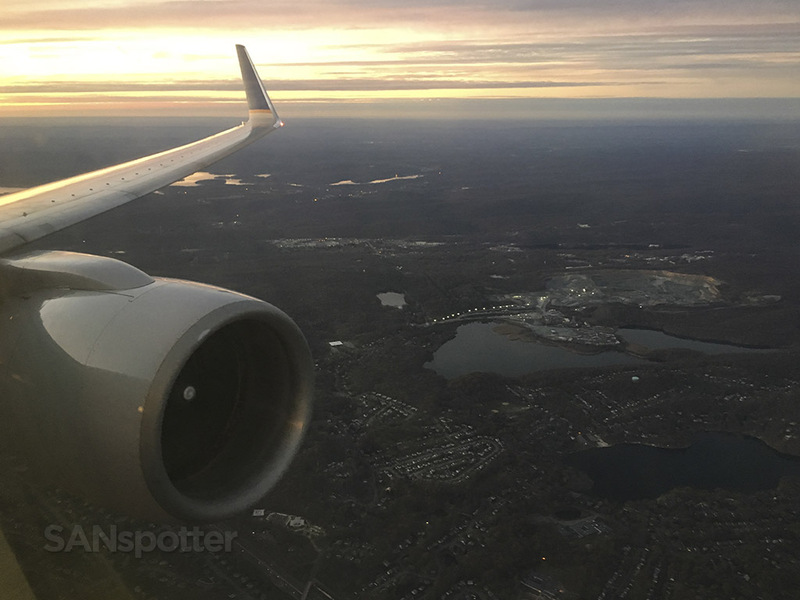 The only sliver of a view I could manage of the 757-200 that would take me to EWR this morning. Not a lot has changed with P.S. since it’s inception, other than a cabin refresh in 2010. They also dropped JFK like a hot potato in 2015 and moved all of their premium flights to EWR to consolidate operations. 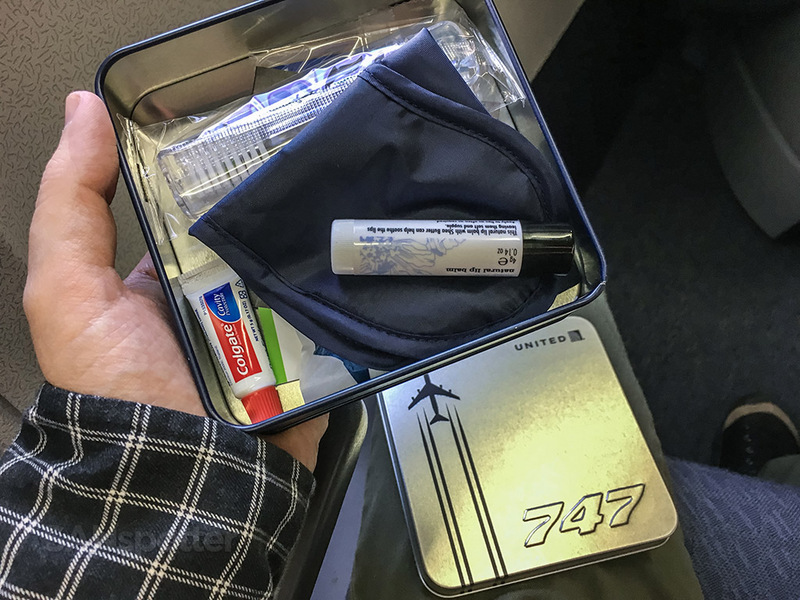 But when it comes right down to it, this product hasn’t changed in 8 years, so at least United has given me ample opportunity to take my time before giving it a try. 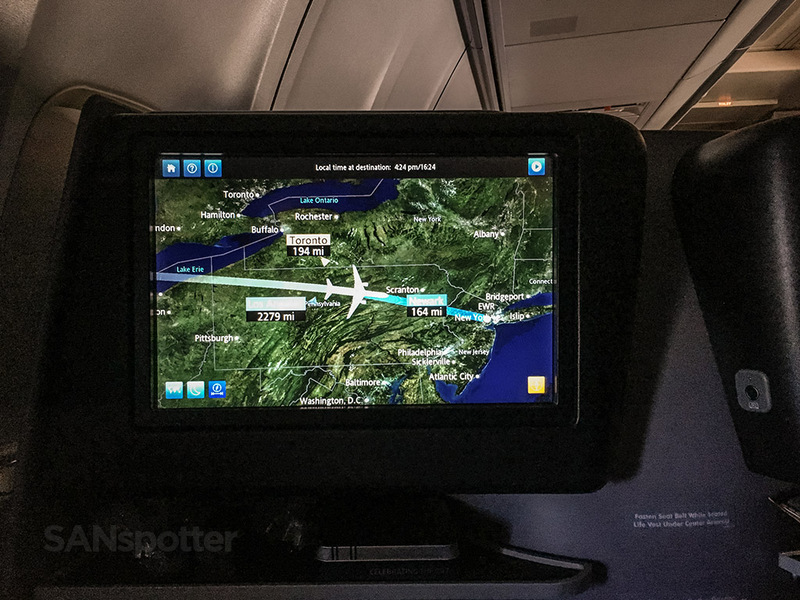 The downside is that it’s been so long without an update that it’s no longer considered all that premium anymore – especially with American Airlines and their fancy new A321s on the scene, which features incredible business and first-class cabins. 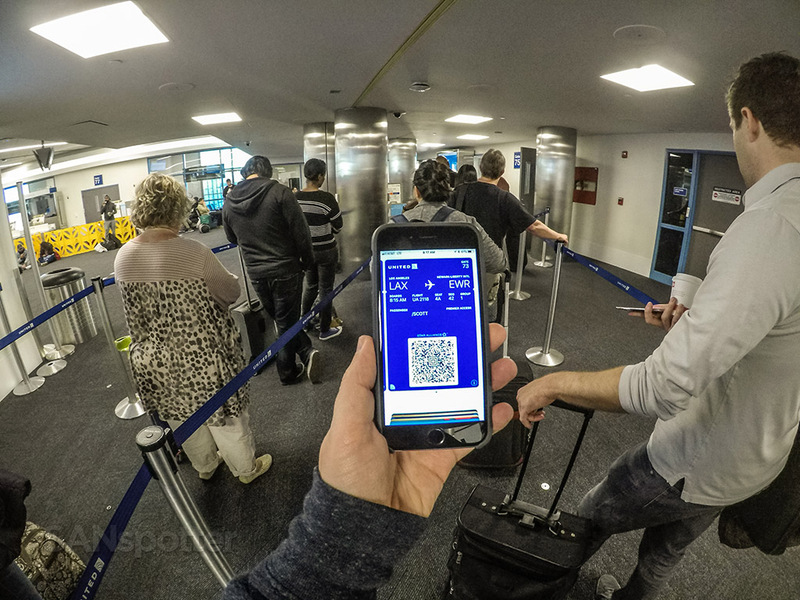 JetBlue Mint is just as good (if not better), and even Delta has got a strong product with Delta One. 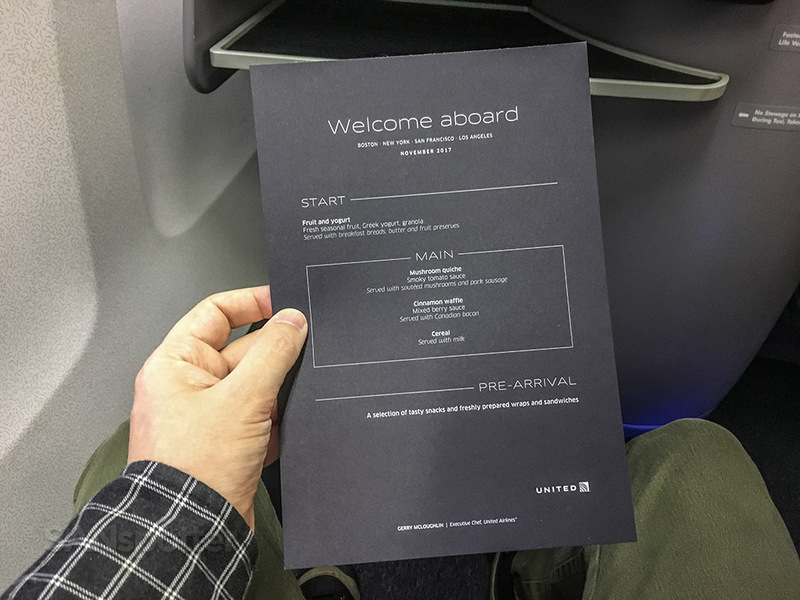 Sorry United, you’re no longer king of the mountain when it comes to a premium coast to coast business class experience. 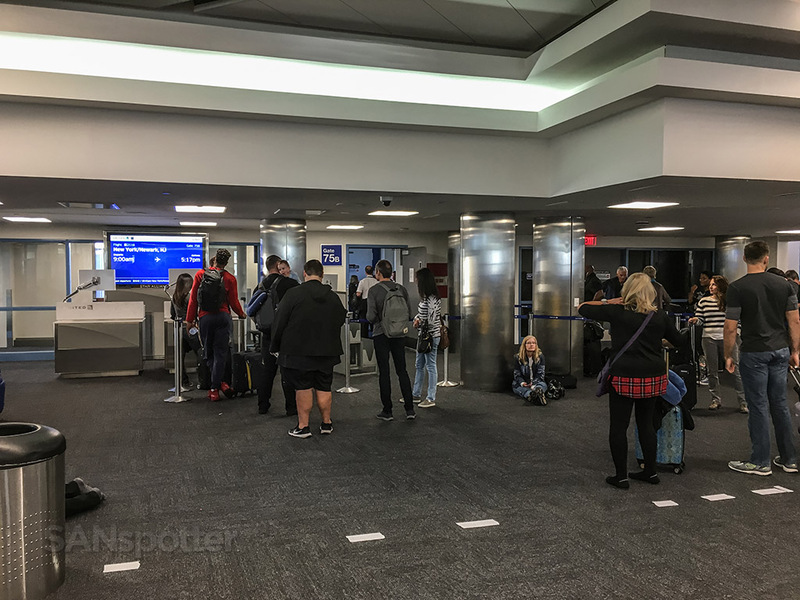 Terminal 7 at LAX leaves a lot to be desired, so it felt kind of anticlimactic to be standing there in line to board a very premium flight in what felt like what was essentially a bus station. 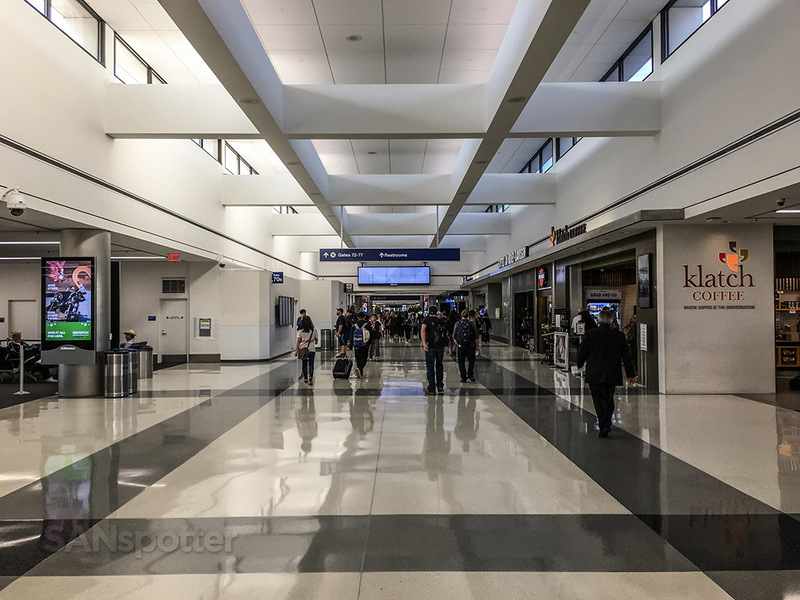 I realize that not everybody on this flight was flying up front of course, but still – I hope there are plans to renovate terminal 7 into something a lot more substantial than what it is at the moment. It’s dark and gloomy place. This boarding queue isn’t quite as glamorous as I had envisioned it 14 years earlier, but I’m here, and that’s all that matters. 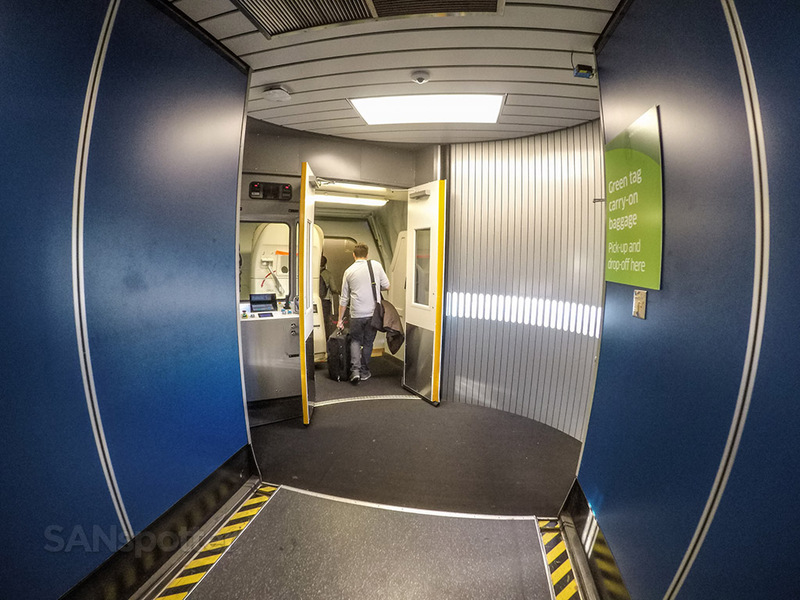 Boarding for this flight to EWR started right on time, and as I was walking down the jet bridge I was starting to think about when my last 757-200 flight was. 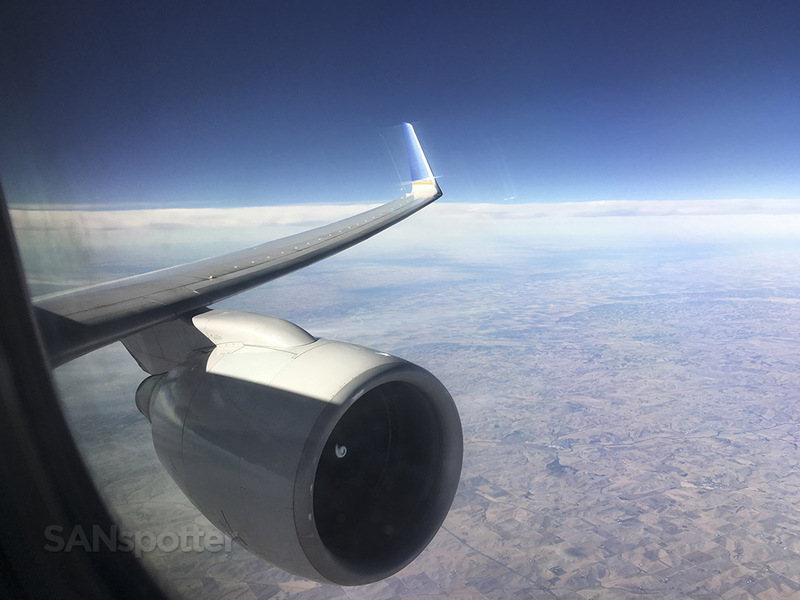 You may not know this, but the 757-200 is my most frequently flown aircraft with 102 segments under my belt so far. I’m not exactly sure how that happened, but I guess it makes a bit of sense considering that it used to be the primary aircraft flown between the West Coast in the Midwest / East Coast in the early 2000’s. I flew coast to coast a lot back in those days, so I guess it added up faster than I thought. If you’re curious, the Airbus A320 is closing in fast to overtake the top spot in my flight log. 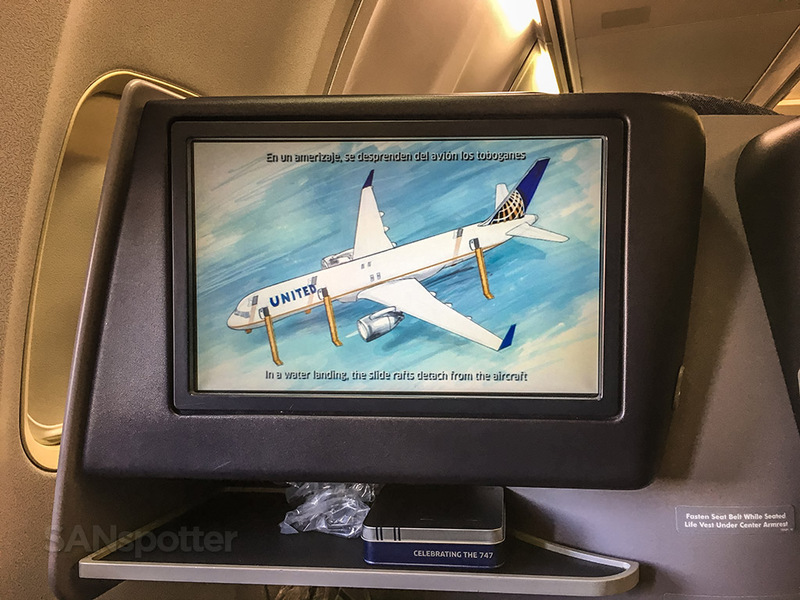 I am at 75 segments on the A320 so far, and it won’t be long until it knocks the 757 off the top of the heap. So sad. Oh yeah…back to my original point: December 27, 2014 was the date of my last 757–200 segment (ATL-SAN on – what else – Delta). I’ve waited 14 years for this. Some theme music would have been nice! 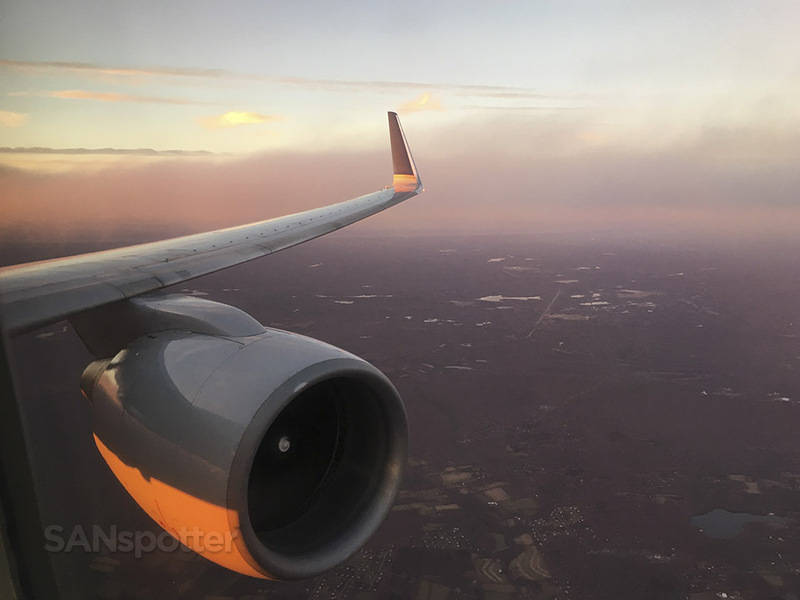 Once on board, it felt so good to make that 757-esque left-hand turn towards the front of the aircraft. God I’m going to miss this airplane when it’s gone. Keep in mind that this was Thanksgiving morning, so that guy’s shirt was totally appropriate and thumbs-up worthy. My first impressions of the P.S. cabin was pretty much on par with what I was envisioning in my head. 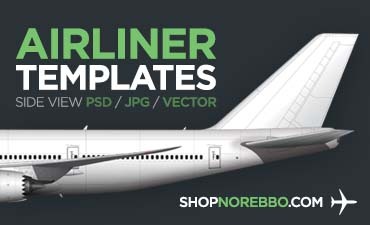 Keep in mind that I was purposely keeping my expectations low so as not to be disappointed, because as I said, this is a very old and dated business class product. 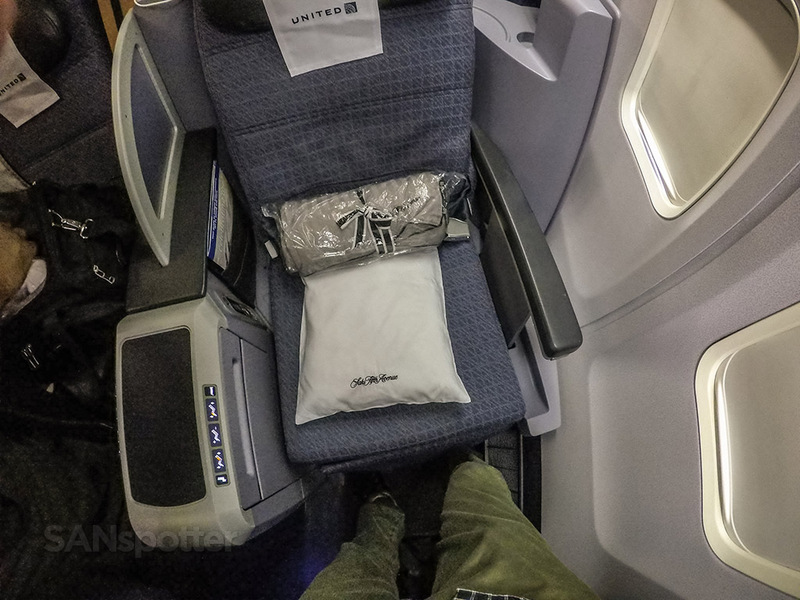 United Airlines 757-200 Premium Business Class (P.S.) seat. 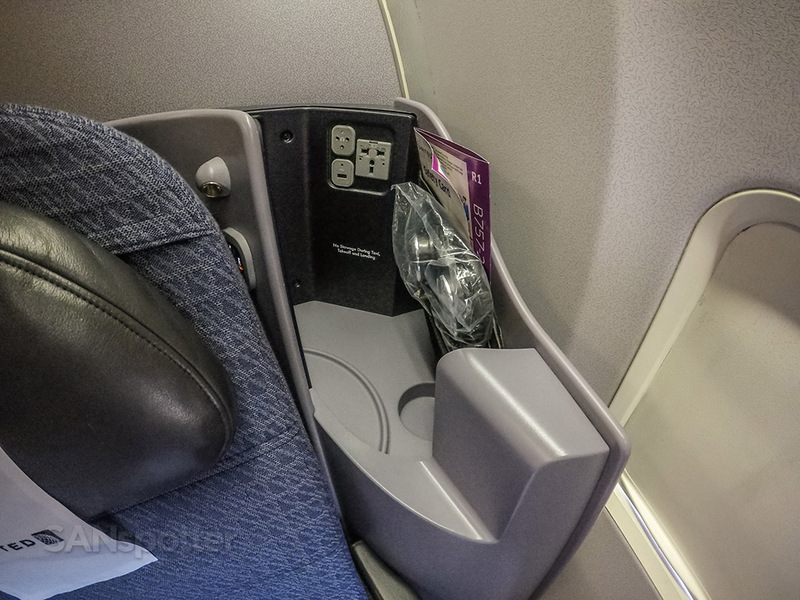 United Airlines 757-200 Premium Business Class (P.S.) seat. I’d also like to take this moment to apologize for not getting the entire seat in one pic. I don’t know what the hell I was thinking – perhaps this moment was too much to handle for my tiny pea-sized brain. I’m usually pretty fussy about my photography, but I’m really scratching my head as I’m uploading these seat pics. 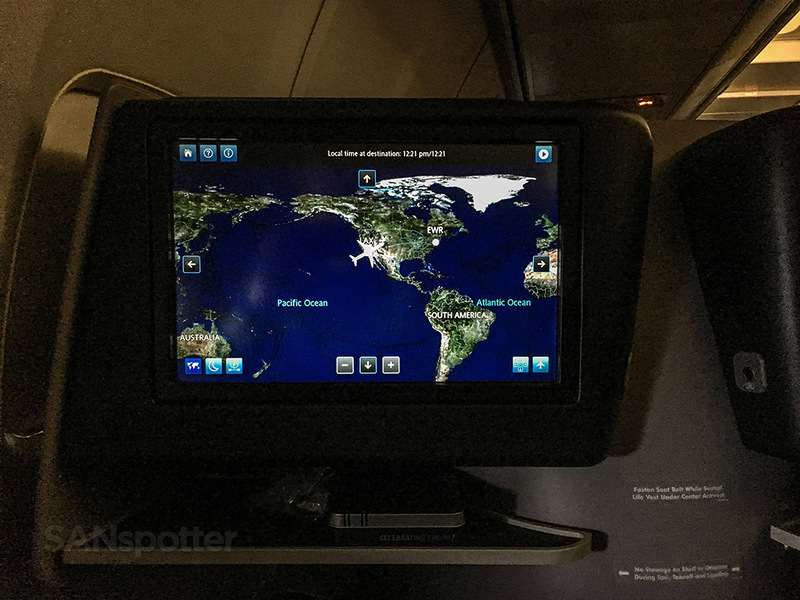 Here’s a pic of the headrest…I guess. I waited 14 years for this and my pics are lousy! This is the cubby to the left of the headrest. I found it to be quite convenient during the flight actually (except during landing, when everything I had up there ended up in my lap). The view looking forward. I like the size of those video screens! And that burger. 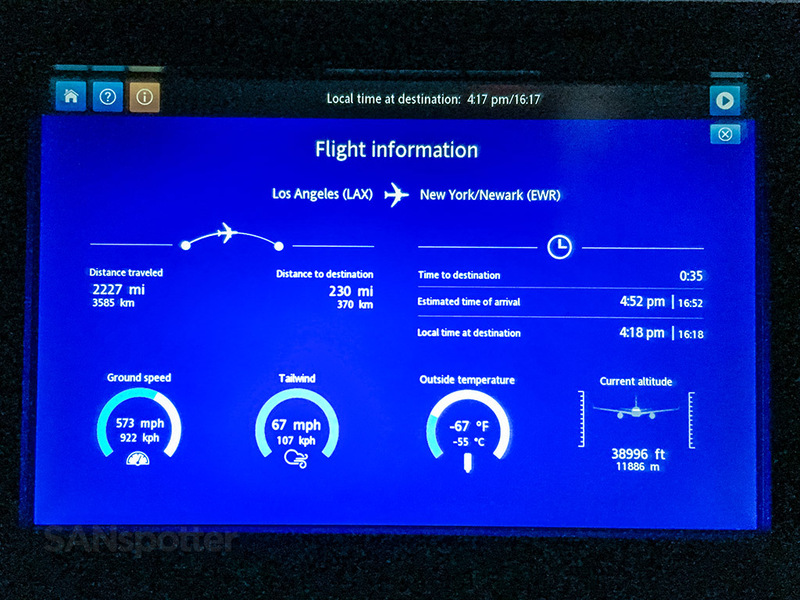 I think now would be a very good time to clarify that this is not necessarily a bad business class product, especially when comparing it with the standard first-class cabins found in most aircraft here in the US right now. It is indeed far better than standard domestic US first class. The problem is that United P.S. business class just doesn’t measure up to the coast to coast competition, and it’s in dire need of a refresh. 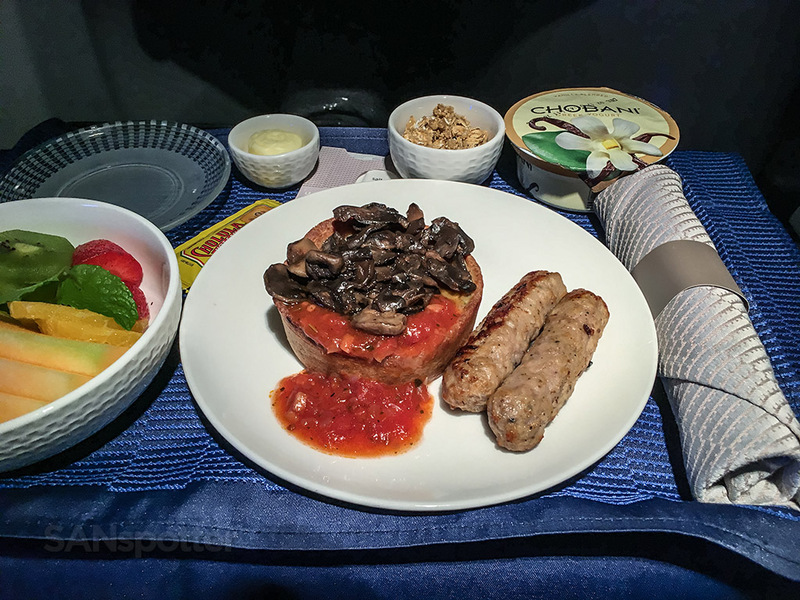 I just wanted to call that out before I get slammed for complaining about what is essentially a premium airline product that is miles better than domestic US first class. It is better. Kind of. But I know United can do much better! 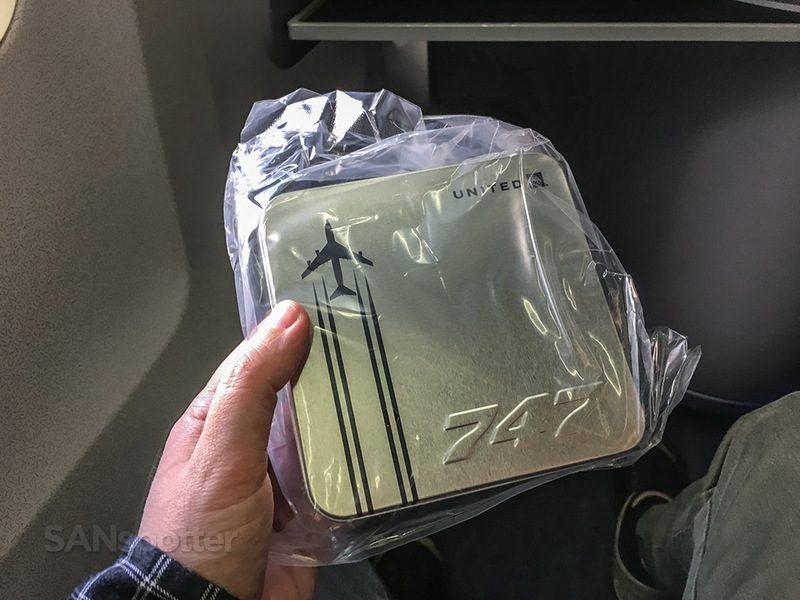 Amenity kits and menus were distributed while on the ground, and it was so cool to get one of those special-edition all-metal amenity kits which were part of United’s big farewell to the 747 celebrations that were going on at the time. That amenity kit eventually found a place in my display case in my office at home. The menu however, well…that was left behind (and not a tear was shed). Score! I’ve been seeing a bunch of people post pics of these things on Instagram, so I’m glad I finally got one of my own. 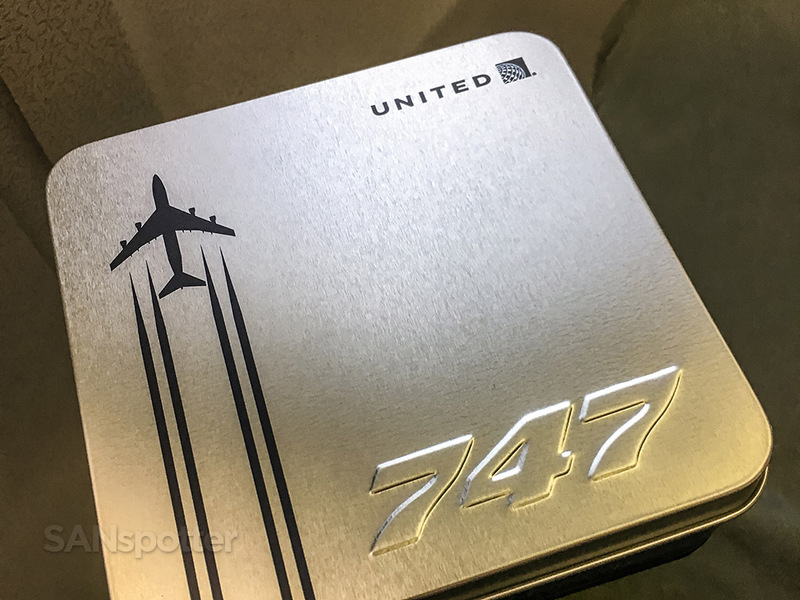 Thinking back on it, I really liked how United airlines gave tribute the 747 before retirement. Why is there no 747 cologne in here? I mean, who wouldn’t want to smell like a 747? Geeking out over that cool amenity kit has made me hungry. What’s on the menu? As long as there’s water, I’m good. It was a full load up front, which did surprise me a little bit considering this was Thanksgiving morning and most people I assumed were already where they needed to go for the holiday the day before. I guess not. We pushed off the gate right on time and from there it was a short taxi out to runway 25R. Safety first! I’ve flown the 757 so many times that I should know this stuff by now. I’d like to say that I’m confident enough to be quizzed on it… but please don’t do that. I think know I would fail miserably. 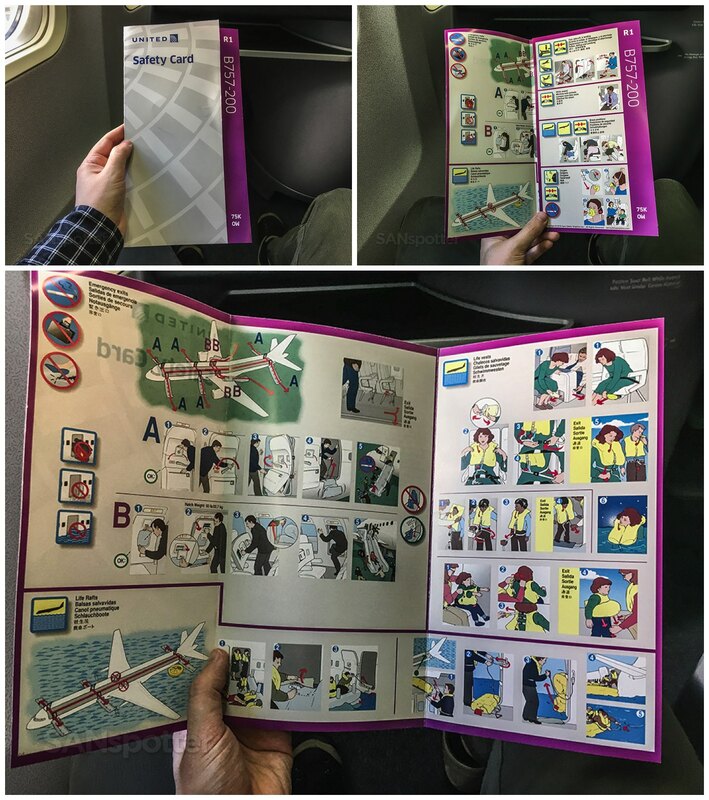 How about a safety video to go with your safety card? It was information overload for me at this point, and I don’t think a single bit of it was retained in my brain. All I know is that if there’s a fire, I’m running to the nearest big hole in the fuselage while screaming hysterically like an eight-year-old girl. 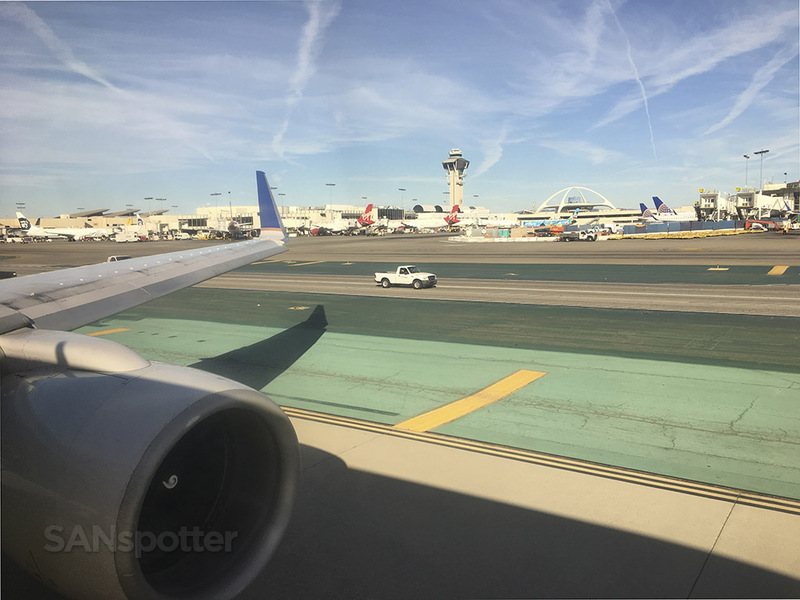 How stressful would it be to push back a large airliner like this 757 at a large airport such as LAX? It gives me palpitations just thinking about it. For these brief two minutes, this guy has all the power. Do what he says or else! 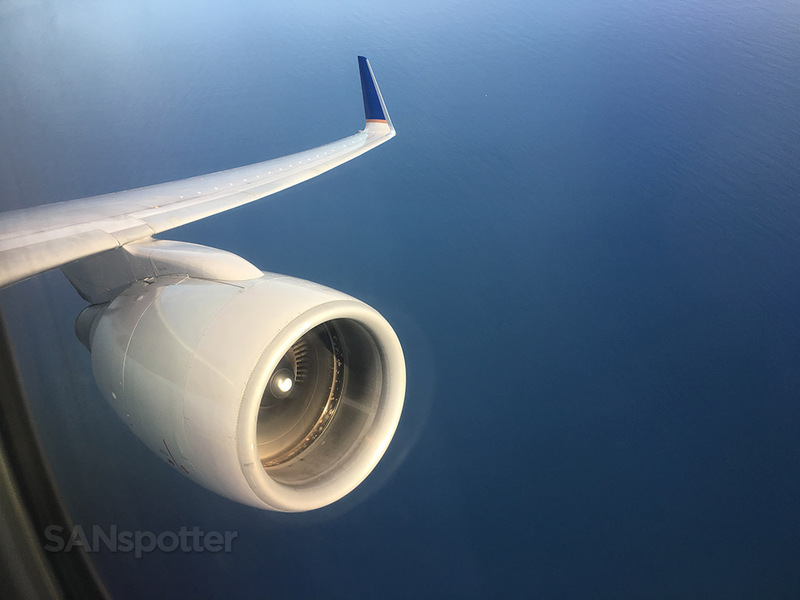 Somehow in all the excitement I missed the fact that this was a Pratt & Whitney powered 757-200 – which is actually a mega-rarity in the United fleet right now. Other than this high-intensity drag race with that white truck, our taxi out to the runway was largely uneventful. We won by the way… but not by much. He was pulling on us pretty strong there at the end, and it was looking iffy. Whoa. That was a fast departure, wasn’t it? Apparently I was too busy shooting video of the takeoff, because I can’t find a single runway pic from this flight in my archive. To be honest, you aren’t missing much. 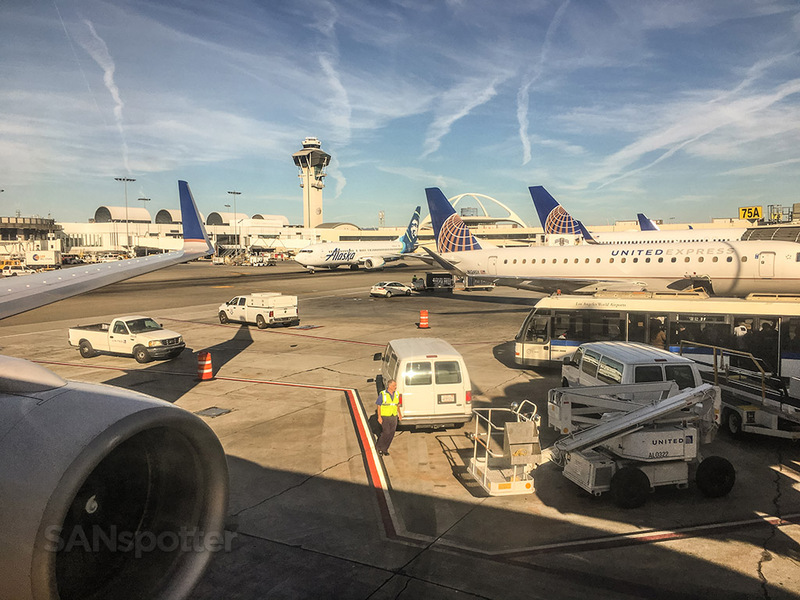 If you’ve seen one departure at LAX facing this direction, you’ve seen them all. *click* *click* *click* *click* *click* – if my iPhone camera made noises, that’s probably what it would be sounding like right about now. Check out that awesome lighting! 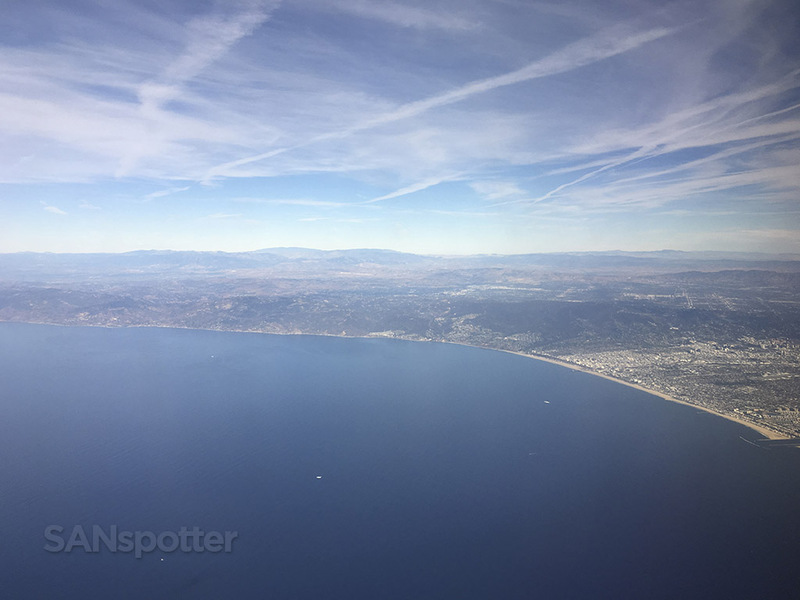 A very typical late November sky over Los Angeles today. So beautiful. Population density that would give Mexico City a run for it’s money. Is it too early to check our position on the map yet? I get jittery if I can’t see our exact position at all times. 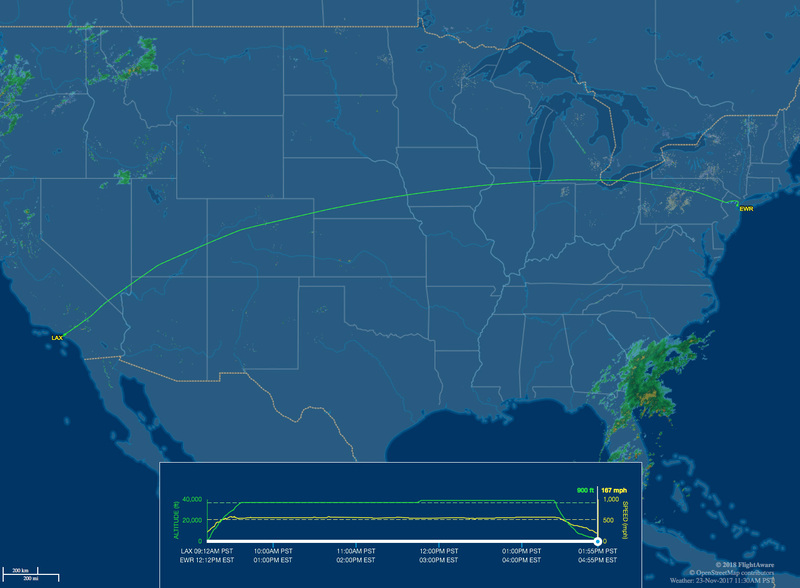 Five minutes into the flight, and the map completely jives with what I’m seeing outside the window below. So far so good. That’s me, doing my best “man” impression. Why do us guys naturally sit like this? I’m glad I’m not a girl, because I don’t think I could ever sit so lady-like with closed knees all the time. Cabin service started nearly immediately right after take off, with hot towels and drink orders lickety-split. They also wasted no time in getting breakfast served, and as a matter of fact they got right to that even before coming through with drinks or snacks. Unfortunately for me, I was the very last person served, thanks to the fact that I was sitting in the very last row of the forward cabin. At least they still had my primary breakfast option! “We hope that your travel today is a breeze.” Why thank you – other than the fact that I had to get up at 3:45 AM, things are going smashingly well so far. This is breakfast, which was actually quite tasty. 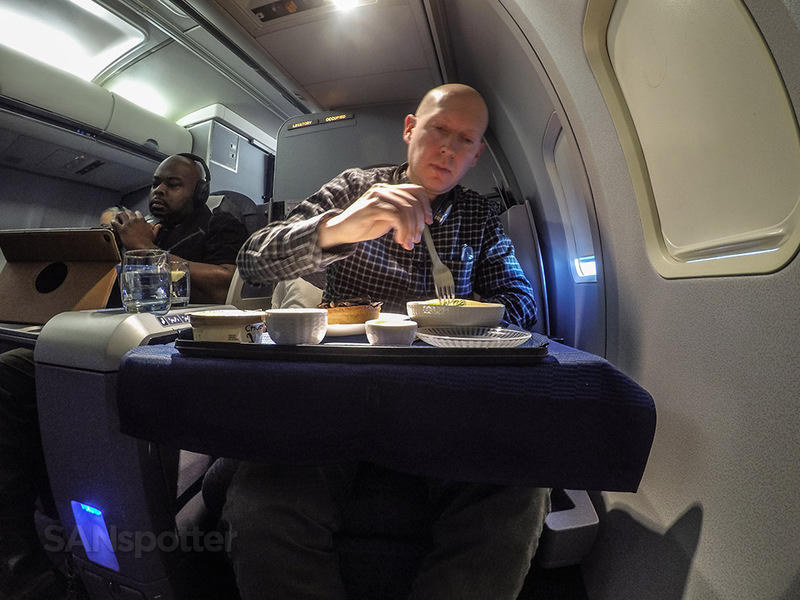 Why the hell is eating on airplanes so much fun? The food isn’t that great, but it still feels like such a special occasion that I can’t help but to hold my fork with a raised pinky. It wasn’t until my seatmate finished his meal that I was able to put the seat in a lie flat position and catch up on some much needed sleep. At one point I woke up just as we were passing Denver. I don’t know what is about Denver, but I always seem to wake up whenever we fly over. About an hour later I got up to use the lavatory. Gee, isn’t this exciting? Hold on, this trip report is going to get better the closer we get to Newark, I promise. 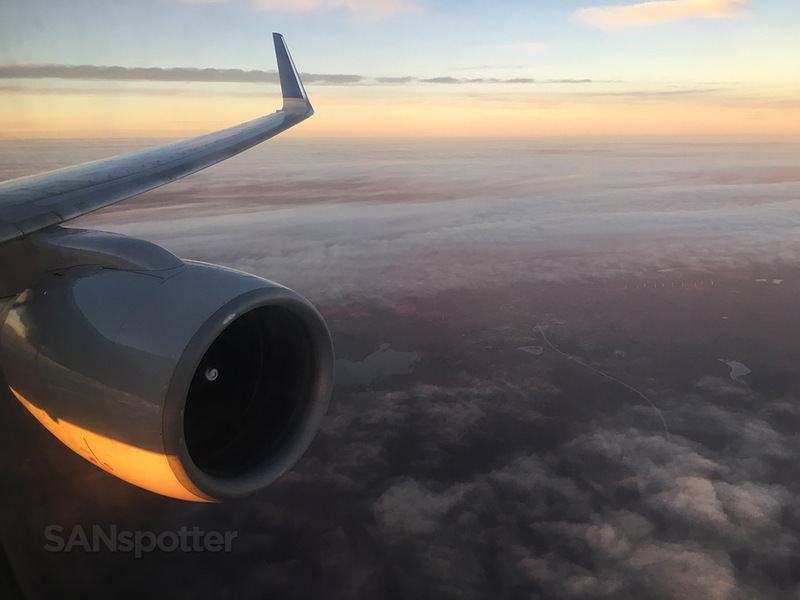 I ended up sleeping for most of the way across the country, and by the time I woke up the sun was starting to set nicely behind us. 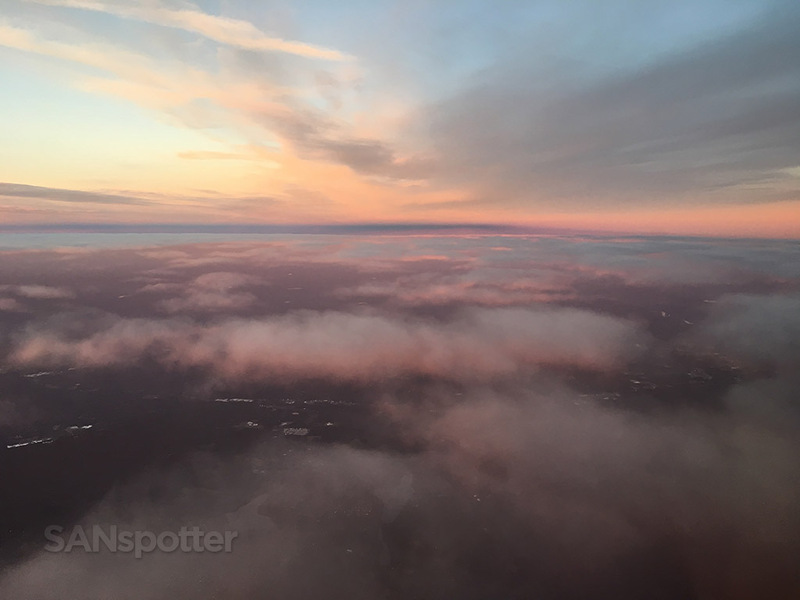 Things were actually starting to get magical outside as we started our descent into EWR; the beautiful pinks and purples of the sunset mixed with the warm brown fall colors of the ground below were simply mesmerizing and it was hard to look away. I think the flight attendants came by with a snack service and hot towels during the time that my nose was pressed firmly up against the window, but I can’t quite remember. I can neither confirm nor deny that it actually happened. Good morning SANspotter! Here’s what happened while you were asleep. Things are starting to look really good out there as we begin our descent. Time for another map check. One can never check the map too often! Where is the eyeballs emoji when I need it? Just look at that sunset! I was starting to feel mixed emotions at this point. On one hand, I was completely blown away by the beauty of that sunset. 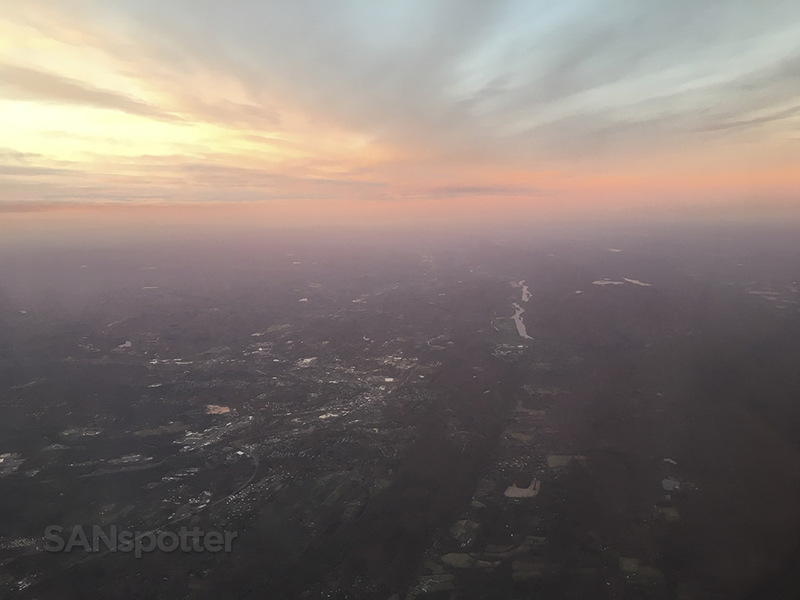 On the other, I was starting to realize that it was going to be too dark to get really nice pics of the New York City skyline our approach into EWR. One more, just because. Just LOOK at that! OK, well, I guess that’s it. Once we dropped below the clouds things were suddenly a lot less magical. 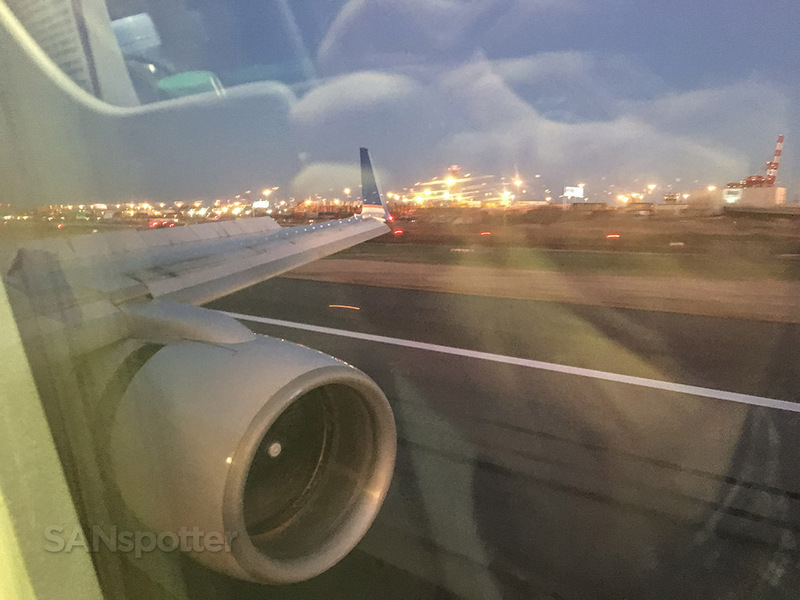 An absolutely amazing view of New York City, ruined by the fact that the cabin lights were left on during the entire approach (window reflections galore), as well as the fact that there just wasn’t enough light to get a decent pic. Oh well. 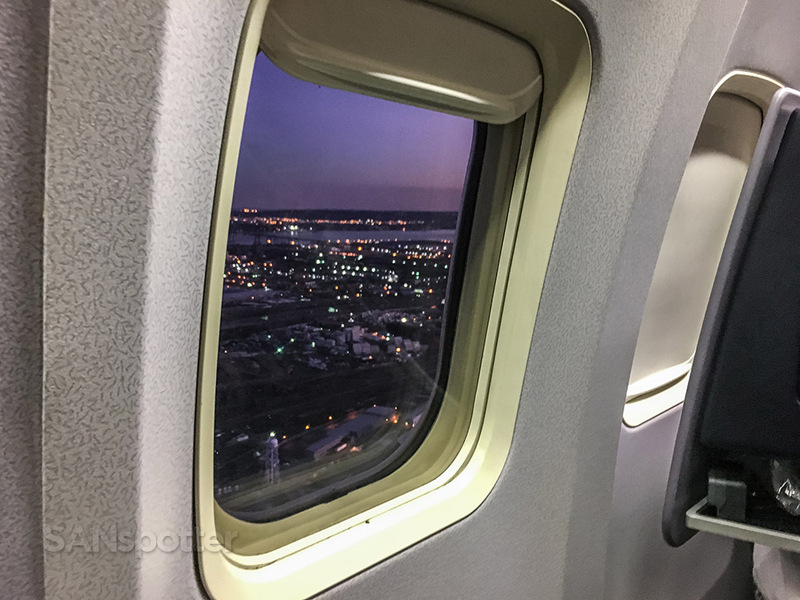 This could’ve been a great pic if the cabin lights weren’t causing reflections everywhere, but…welcome to Newark! It has been a very long time since I last flew into EWR, and I totally forgot how close the approach is to New York City. 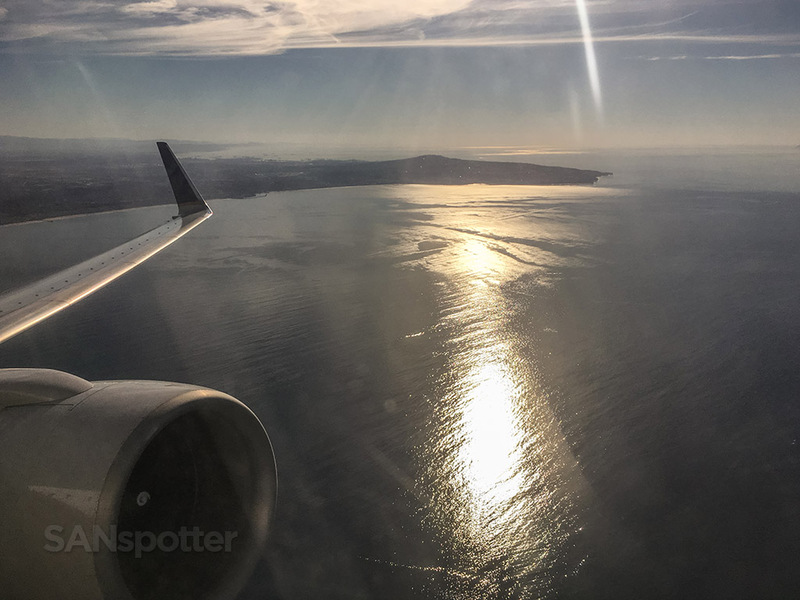 I couldn’t believe it when we skirted right past the edge of the city on our approach into the airport, and it was a bit of a shame that it was a bit too dark to get good pictures of it all. 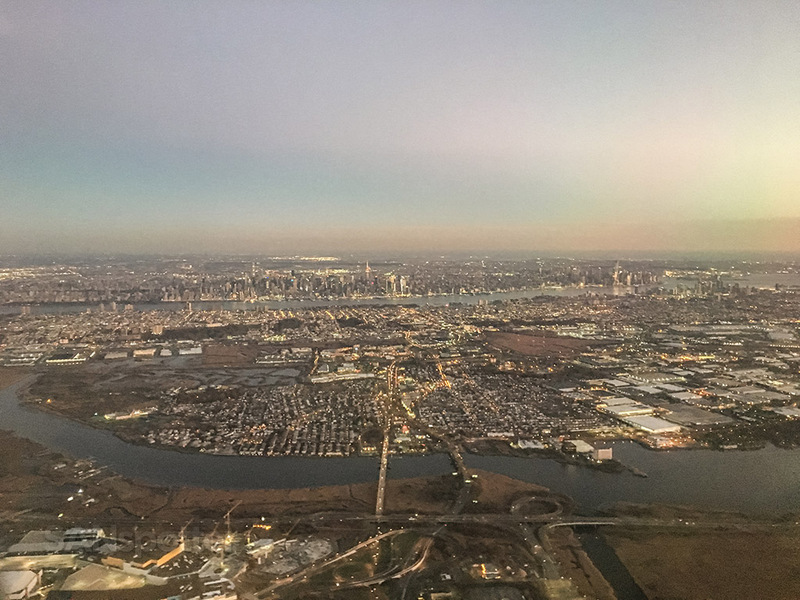 If you’ve ever wondered what airport has the best views of New York City on approach, it’s definitely EWR! The sun still hasn’t disappeared completely yet. One of the best and richest sunsets I’ve seen in a good long while! 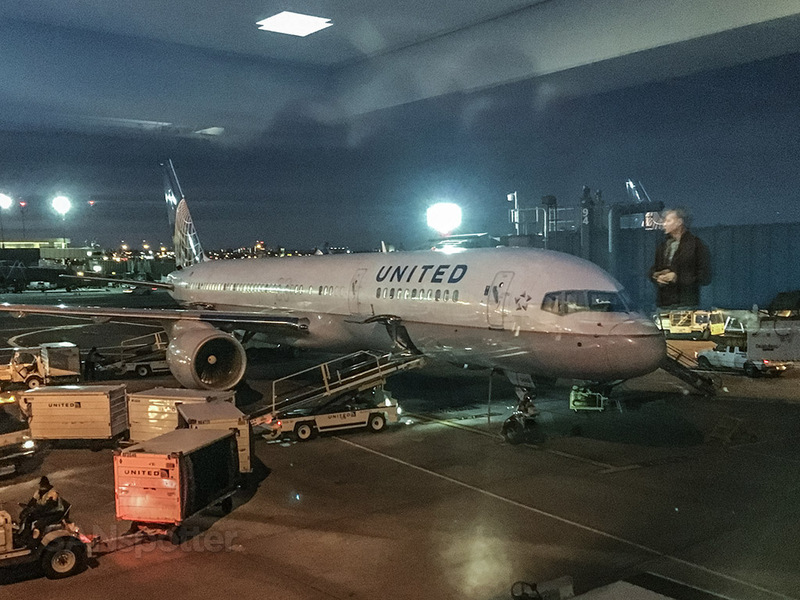 As I was walking off the airplane and into the terminal here at Newark, I couldn’t help but to feel a huge sense of relief and satisfaction for having had the chance to fly an airline product that I’ve been dreaming about for 14 years. Unfortunately, as I said the beginning of the trip report, I waited a bit too long and this dream airline product has become old and crusty around the edges. 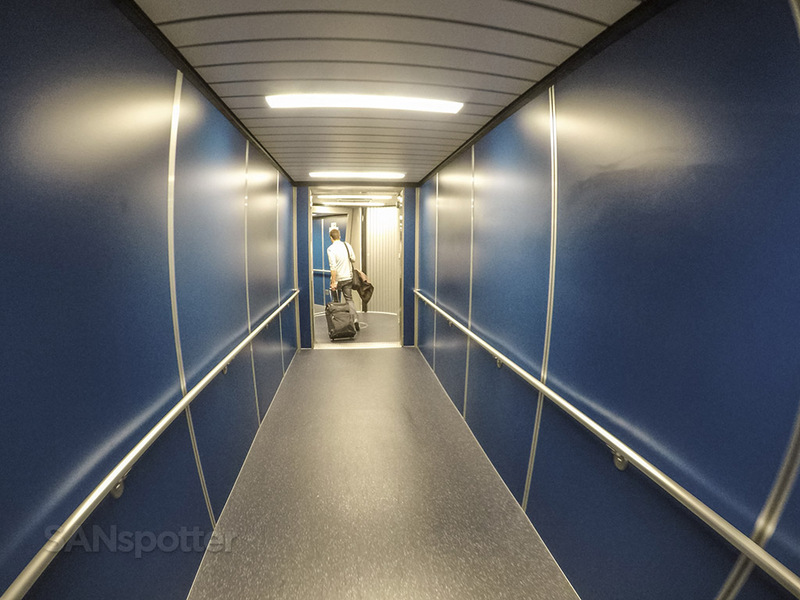 Wow, it’s been so long since I’ve last been here – These jet bridges sure as heck don’t look familiar. 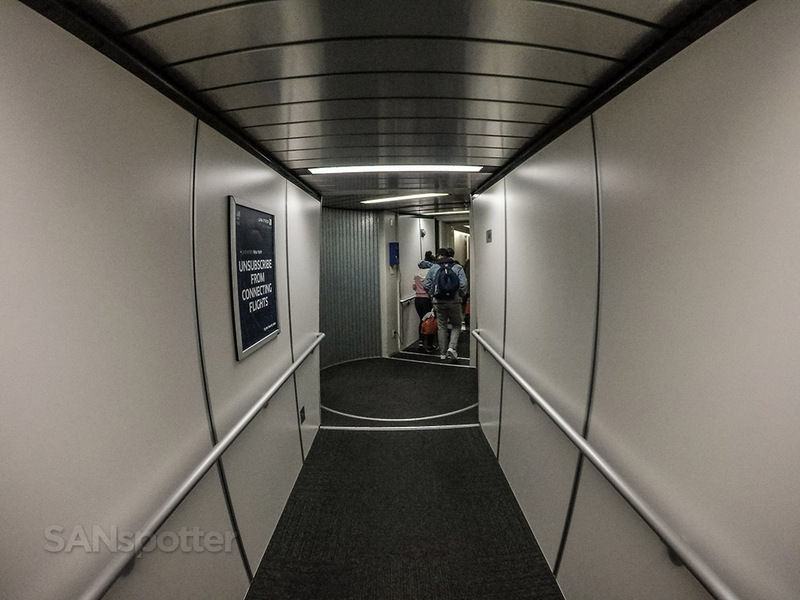 And in case you’re wondering, yes, there are actually a handful of airports around the world that I can identify clearly just from an interior shot of a jet bridge. I’m kind of ashamed to admit that…yet at the same time, I feel oddly proud. One last look at N588UA (with a creepy reflection of a random person floating about) before walking off into the sunset. This is what walking off into the sunset looks like at EWR, by the way. Of course United P.S. 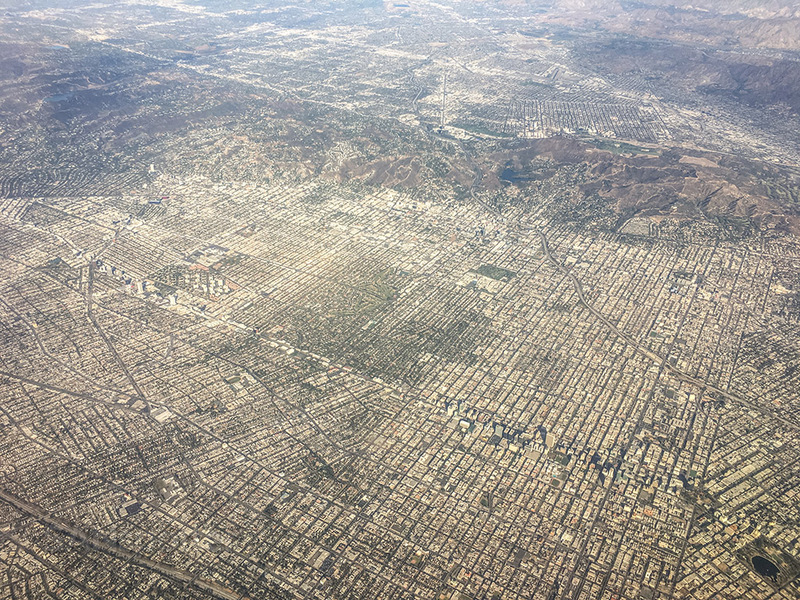 didn’t quite live up to the expectations that I built up in my mind 14 years ago – but I knew that it wasn’t going to even before I stepped onto the plane at LAX. 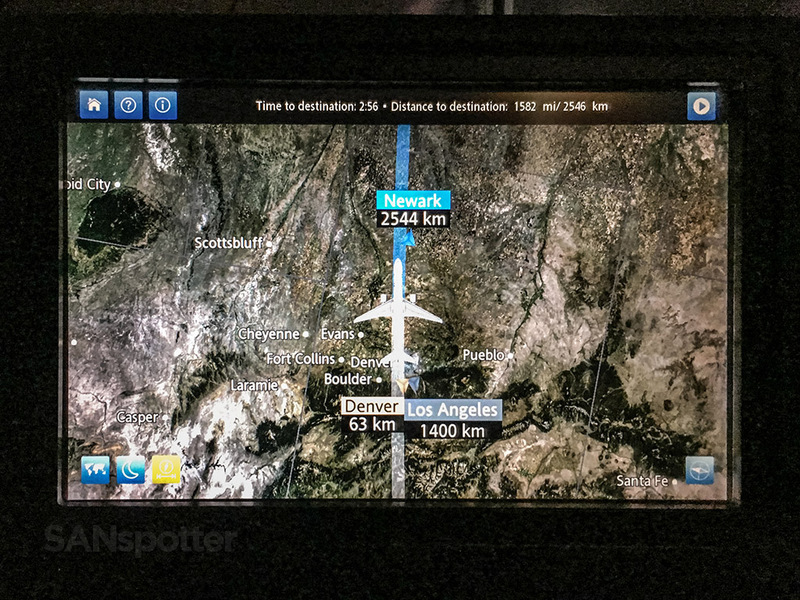 This flight was made simply to scratch it off my airline bucket list – just to say “I did it”. 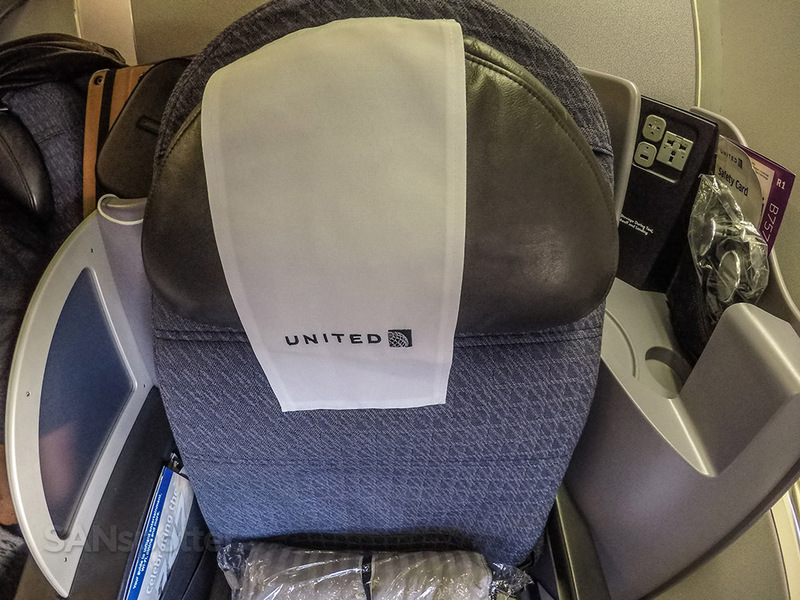 I’ve got a sneaky suspicion that this will end up being a good decision, as United seems to be more than determined to create a consistent Polaris business class product across it’s entire fleet and chances are pretty good that we will see a new premium transcon business class product soon. At least I hope so – not only for my sake, but for theirs as well. Wow! I’ve never flown in or out of LGA, so I think I spoke too soon! That is definitely one heck of a view. And what’s this about Camden Food Co at other airports?? Haha…in all my travels I have never seen them anywhere other than SAN. I had no idea it was a franchise! 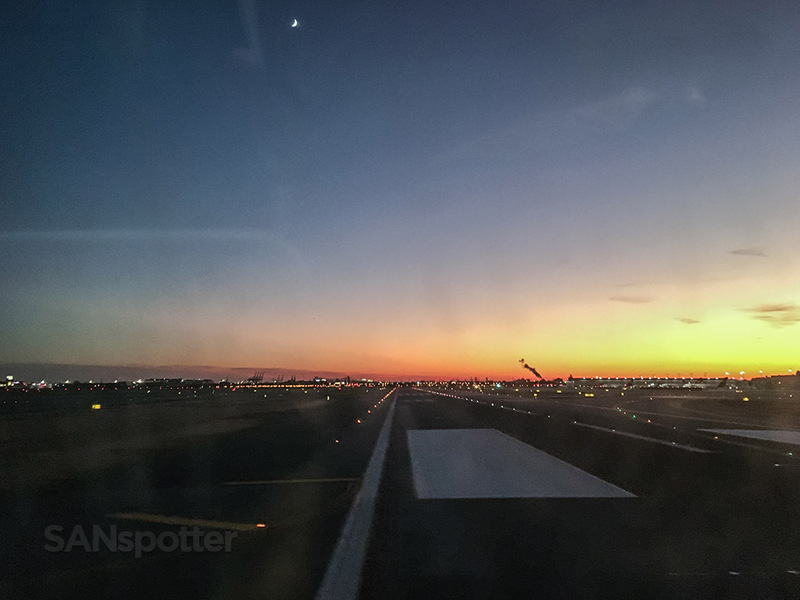 LGA is the dump you’ve heard that it is… but it’s 15 mins from my apartment and offers some incredible views so I have a soft spot for it as my home airport. Delta’s terminals aren’t tooooo bad. Give us a few more years and it’ll be amazing! Unlikely to lose that 1,500 mile perimeter limit though so probably no flights to SAN anytime soon. Maybe they’ll open up a Camden Food Co! Haha, I have never seen one anywhere else either!! 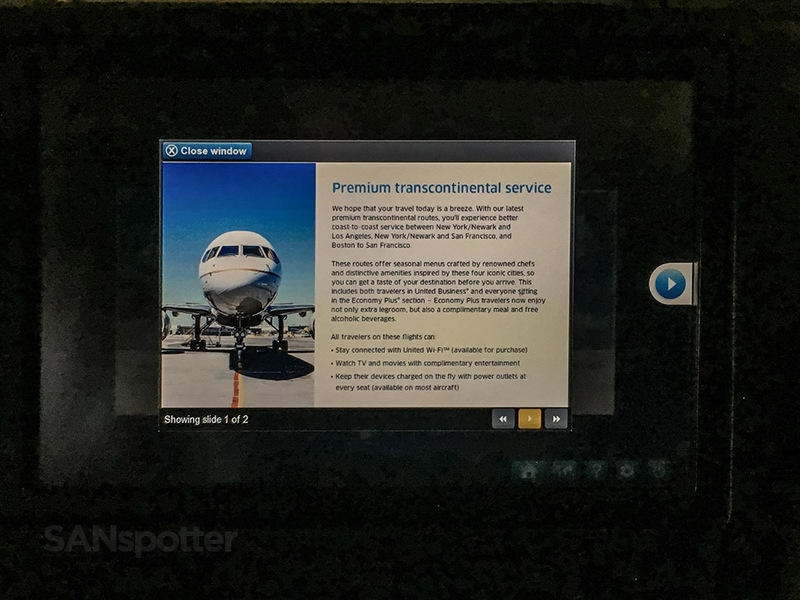 Thank you very much for a very thorough and informative article on United’s PS Business service. Great pictures. In the photos, the seats look very modern to me. Is it any easier to climb over your seat mate than in domestic first? 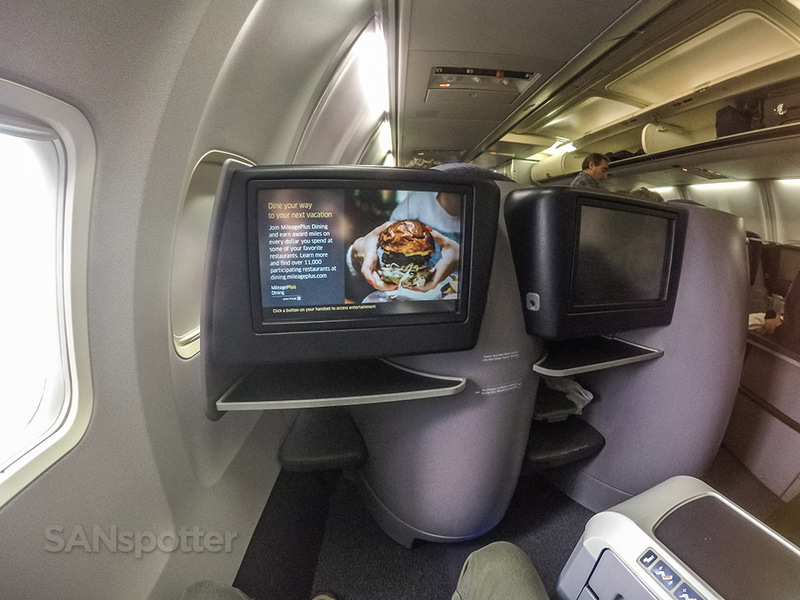 Also, how do these seats compare to the so-called Polaris seats on the Internationally configured 757-200s? 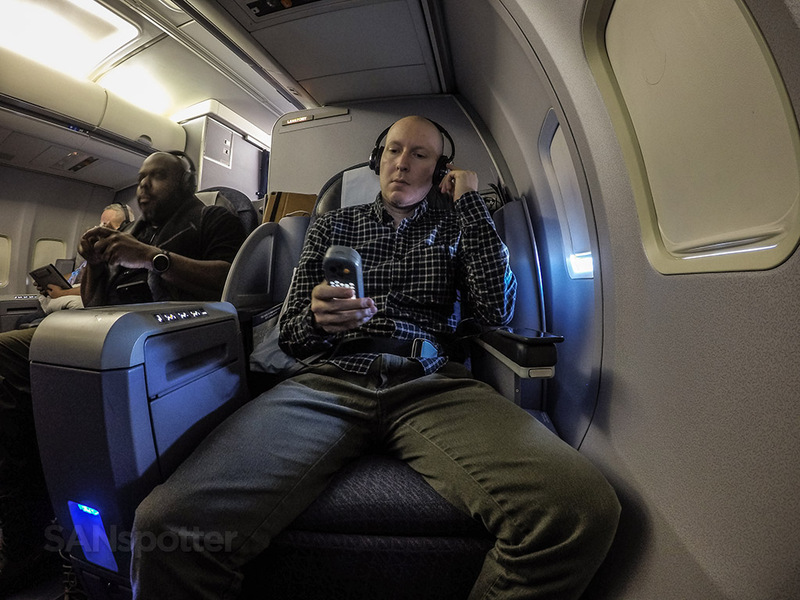 Hi Emile – yes, these seats are very good when compared with standard domestic US first class seats, as they are fully lie-flat with generous amounts of leg room. And yes, that extra amount of leg room makes it much easier to get around your seatmate. Note that you’ll still have to step over their legs if their seat is fully reclined, but it’s not too difficult if you’re somewhat limber. Unfortunately, these seats aren’t quite up to par with the newest Polaris seats. 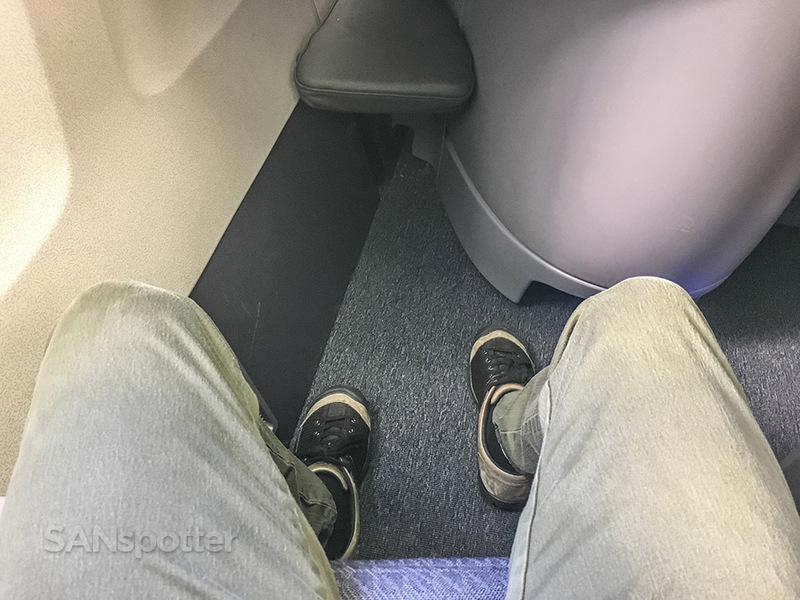 The biggest difference is privacy – there isn’t much privacy in these, but the internationally configured Polaris seats are more “cocoon” like. Thank you for your quick response. 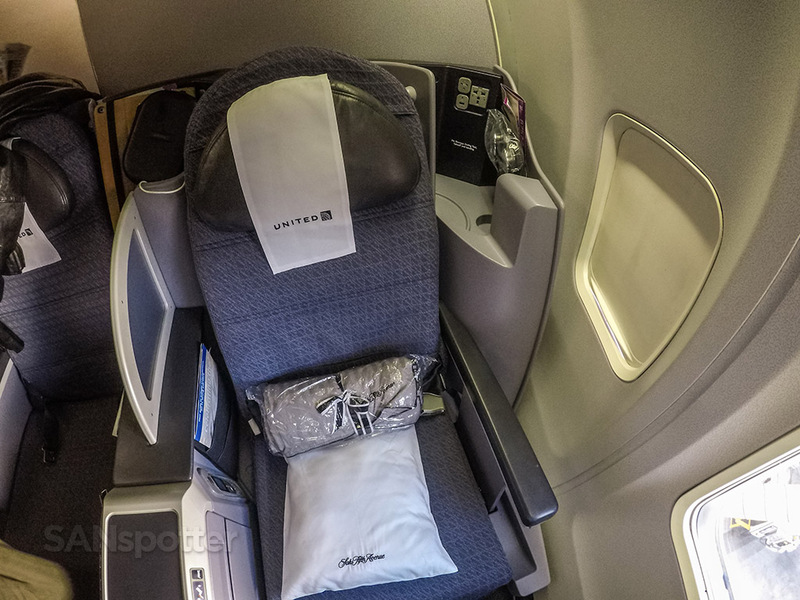 United’s international 757-200 “Polaris” class seats are not being upgraded to true Polaris as they are on the 777s and 767s. 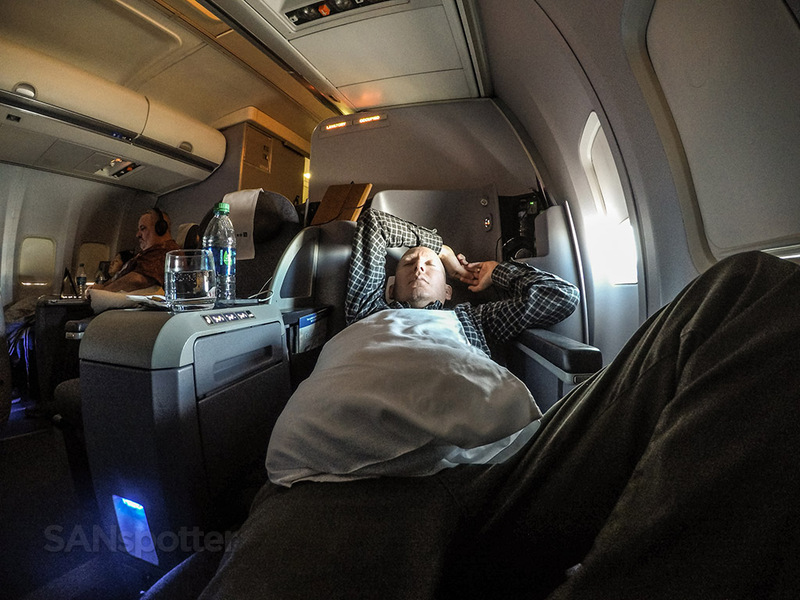 So I am wondering if the PS business seats are the same as those on the 757 international runs. I do believe the PS seats and 757 international seats are the same. Maybe someone else can chime in if I’m wrong, but I’m pretty sure that’s the case. I’ll be flying business internationally on a 757 in about 11 days and PS in August. I’ll let you know for sure. Thanks again. Thanks – I’m looking forward to hearing about your experience! Enjoy your flights! You are correct. 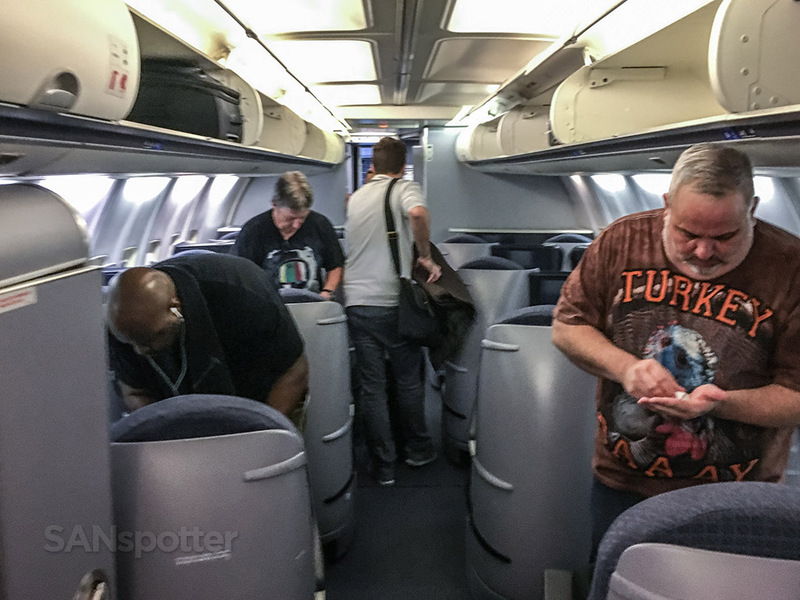 We were on the International 757-200. 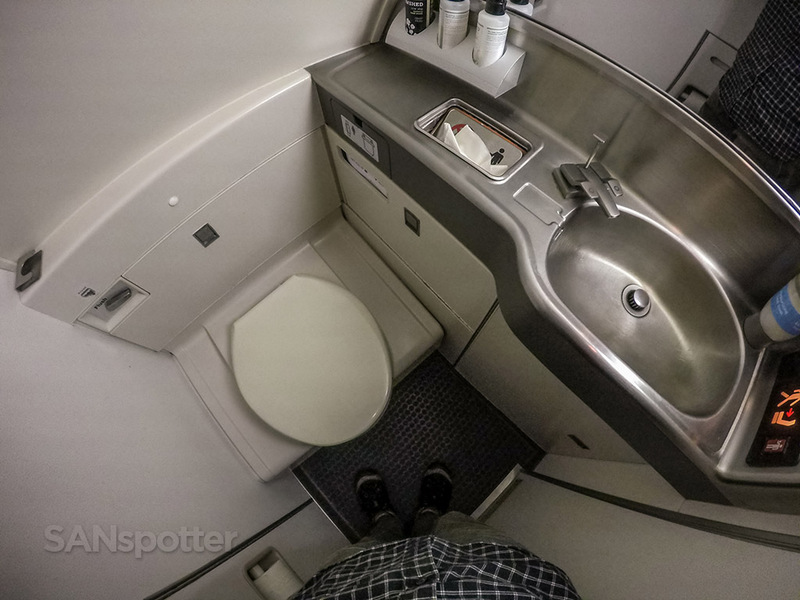 The business class seats and lavatory are exactly the same. 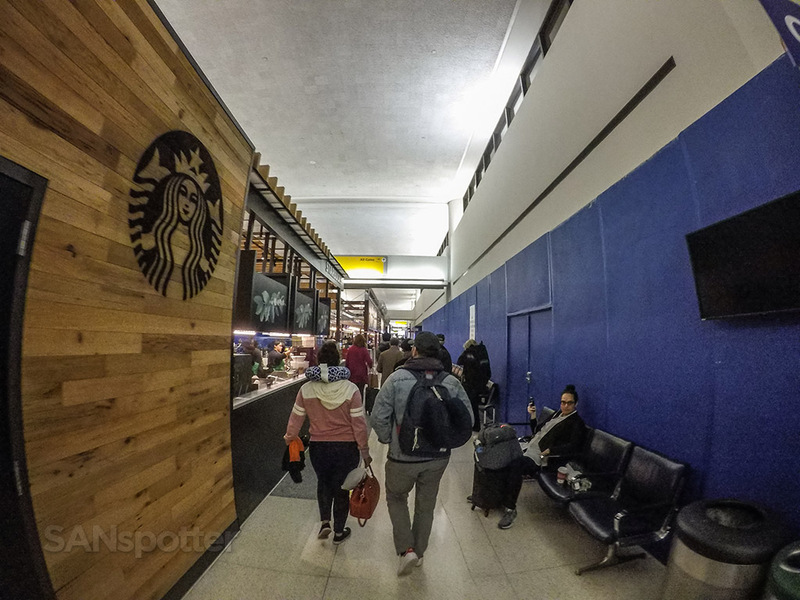 Only difference is here in Newark, we will not be allowed to use the new Polaris lounge, which is only for international flights. 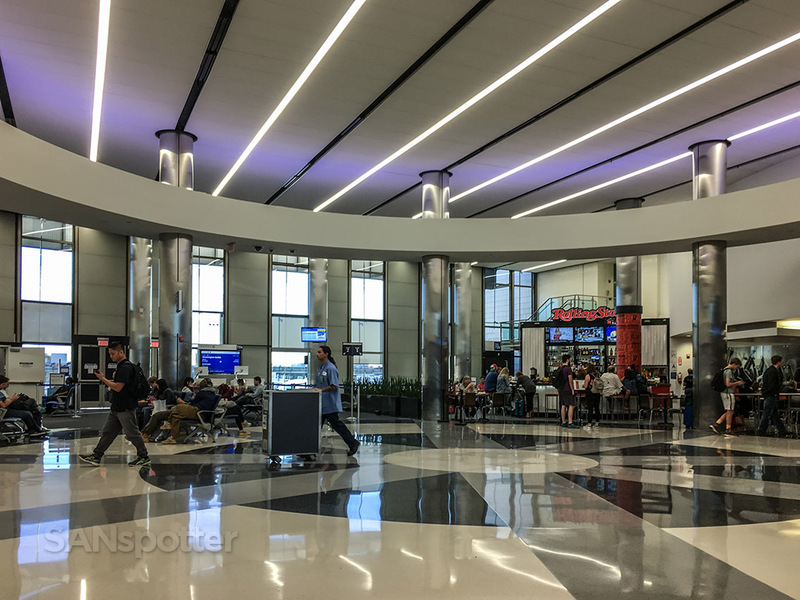 And, it is a big improvement over the United Club. Bummer about not being able to use the Polaris lounge!! I’ve heard so many good things about it, so it’s unfortunate that it doesn’t come as part of the experience.